First there was disbelief. Then there were tears. Brazil's World Cup dream was ended in humiliating fashion after it was obliterated 7-1 in the semifinals by Germany. 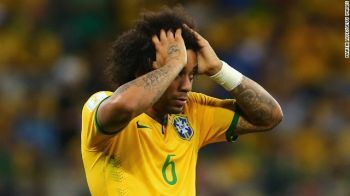 Beaten, battered and bloodied and this a nation which had not lost a competitive home game since 1975, Brazil conceded five times in 18 minutes during the first half as Germany ran riot. Thomas Muller's 11th minute strike gave Germany the lead before four goals in six minutes destroyed Brazil's hopes of winning the tournament on home soil. Miroslav Klose became the World Cup's all-time leading scorer with 16 when he netted his side's second, firing home the rebound after Julio Cesar had saved his initial effort. A minute later it was 3-0 -- Toni Kroos thumping home from the edge of the penalty area as Brazil imploded. With Brazil floored, Germany's ruthless streak came to the fore with Kroos adding his second after a one-two with Sami Khedira. And it was Khedira who made it five, finishing coolly after neat interplay with Mesut Ozil to leave Luis Felipe Scolari's men decimated. Booed off at the interval, there was little to cheer about in the second half with Andre Schurrle's 69th minute strike rubbing salt in Brazilian wounds. As Brazilian fans began to leave Estádio Mineirão in Belo Horizonte, Schurrle netted a spectacular seventh to inflict the nation's heaviest ever defeat. Oscar's late effort reduced the deficit to a mere six, but not even he could bring himself to celebrate such was the embarrassment. Germany, playing in its fourth consecutive World Cup semifinal, will now face either Argentina or the Netherlands in Sunday's final in Rio de Janeiro.